When I moved to Los Angeles in 1979 I had no idea that I would be working in games. My intention was to become a model maker for the movies! 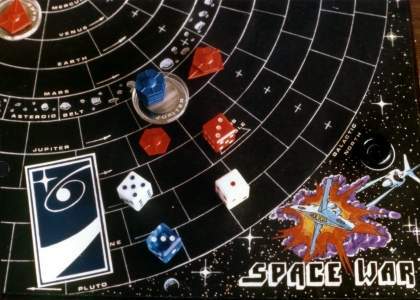 Two years previously, while working as an engineering model maker, I had designed my own original board game, because I was an avid game player. I had made an exquisite prototype, and had pitched it to major game companies (each time withdrawing it impatiently before ever getting a rejection). But still, the notion of becoming a professional game designer had just never occurred to me! I keep hammering in this point: follow your interests. The things that you enjoy doing are things that you will do well. It's better to work at something you enjoy and excel at than to work at something you don't enjoy or do well at. And see Lesson 12 for more ideas for things you can do at home (like designing your own original board game) to enhance your chances of getting a career in games. That part time job having become full time quite some time back, I was working at my workbench in the model shop (undoubtedly making some kind of plastic housing for some kind of electronics) when coworker and friend Gerry Karr came over. He told me, "I just got handed this really weird assignment. I'm supposed to program games for a watch. The display is just dots and circles! What am I supposed to do with that?" This is the display Gerry had been given to work with. I said, "You need games? I can give you games. Let's go to lunch." Over lunch, we brainstormed several ideas. Mostly we thought of ways to do miniature ripoffs of arcade games, but there were some original ideas in there too. We brought back a long list and went over them with Gary Niles, who was the V.P. in charge of the project. He liked some of the game ideas, and directed me to write them up. Just like that, I was a game designer! This is why I advise wannabes to "just get a job in the game industry." Once you are inside, you can get that designer title, if you are suited for it and if you play your cards right. I started by hand-writing the ideas. You know what that's like. As you proofread it, you get thoughts for clarifications and find gaps needing filling. So you scribble edits in the margins - sideways, upside-down... we've all been there and done that! When I'd present these lovely works to Lucy Warner (Jay Smith's secretary) for typing, she had a hell of a time reading them! So I literally cut (with scissors) and pasted (with Scotch tape) the design together. No more sideways and upside-down writings. When Lucy's typed versions were handed in, it was determined that my design writing basically sucked. Jay Smith (the president of Western Technologies) gave me a sample game design to use as a template. I had to learn how to write a whole new way, using words like "increment" and "decrement." I learned to precede bullet point lists with the phrase, "as follows." The design document needed not only text but also pictures, in order to convey the sense of the game. It would have been a real pain to redraw the watch every time I needed to illustrate a point, so I made an outline of the LCD display and ran off copies on the photocopier. Reminiscent of a kid's coloring book! I simply filled in shapes as needed to illustrate how the game would look. I used shades of gray to illustrate motion. After getting words typed and pictures drawn, then it was "Cut & Paste" again. Pictures were pasted in with Scotch tape. Then the pages were run through the photocopier to make the finished document. 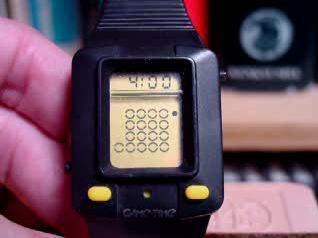 NOTE: The watch shown above is one of the earlier versions, manufactured with yellow buttons. The second run had black buttons (to look more like a real watch and less like a toy). I have one of each. The ones seen at the Classic Gaming Expo are usually the black-button variety. Chris Romero (the owner of the black-button one at the 2002 CGE museum) was most interested to see the yellow-button variety! I learned quickly that my writing rarely gave enough detail for Gerry to work from unaided. I learned as I went along how to improve my writing. One trick I used was to anticipate questions and address them in the design. Still, Gerry often required me nearby as he was working, so that he fully understood what I wanted in the game. I even served as alarm clock and chauffeur on occasion! This all took me away from the model shop, which didn't sit well with my boss, Walter Nakano. But the times were changing, and as Western Technologies' focus shifted more and more to electronic software (and further and further away from electronic toys), the model shop shrank and eventually went away anyway. The programming work that Gerry did was actually just a working demo. 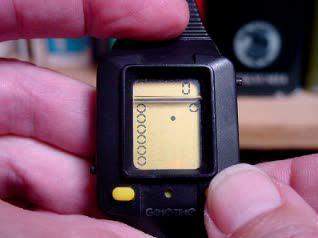 The work he did was used for a working model of the watch, and as source code that the actual programmer (in Japan) could use for the real watch. GCE was having the watches manufactured in Hong Kong, using chips manufactured in Japan. Gerry traveled to Japan to help the programmer there understand his code. I had never been outside North America, and I was envious! Having designed the Game Time games, my next project was to design the LCD and games for Arcade Time, the next watch in the series. It was probably getting towards 1982 by this time. 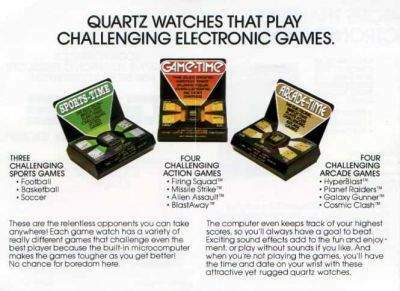 In all, there were three game watches. My friend Patrick King designed the games for the Sports Time watch. The assignment: create another game display that was capable of multiple games (this being our line's main selling point over the competition, Nintendo's Time Out line -- later called Game & Watch). You see, for Game Time, someone (perhaps Jay) had already specified the display -- then I came along and volunteered some game ideas for it. But this time, there was no pre-designed display. And it was my assignment to design one -- and, of course, to design the games for it. Above the AA guns at the bottom, the main display consists of saucers, tailfins, and bombs. The tailfin segments (used to turn a saucer into a rocketship) were also used as rays or beams. The bombs doubled as AA flak. The client (GCE president Ed Krakauer) needed convincing that this display would play reasonable games. Nowadays, it's easy to use computer tools (even for a non-programmer like me) to demonstrate how a game will work. But in 1982, you had to be a computer whiz to make computers do fancy stuff like that. We didn't yet have GUIs and off-the-shelf graphics software and color monitors. So I had to make hand-drawn videotape animations. We rented a stop-motion animation setup from Lyon Lamb. Then I made a series of sheets of the game display, and laboriously created a videotape showing how a game would look. Then as I played the tape, I had to talk through what was happening on screen. This presentation method achieved the desired result - the display (and the games planned for it) were given the green light. The guys who usually did our technical drawings were both busy on another project (probably designing the Vectrex housing), so I had to do the technical drawings for the LCD. I had had experience using a drawing board before (in college, for lighting design, and in my engineering work, for pipe diagrams), so it was no big deal for me to use the equipment. But I had to learn about the rules of LCD design. Each element had to have a lead, which had to go to the main contact strip. Each lead had to be a certain minimum width. The gaps between each element or lead had to be a certain minimum width. Sometimes the designer has to use different tools and learn new skills in order to get the job done. All those things I had done previously, like going to college, studying drafting, working in model making, and building my own original board game prototype, had all led up to me being in this job at this moment. It's as though all along I had unwittingly been taking baby steps into the future. FOLLOW YOUR INTERESTS. GO TO COLLEGE. ...End sermon. 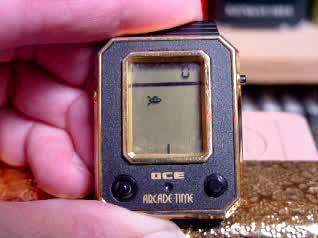 I've forgotten to point out the little joystick on the Arcade Time watch. In the pictures and mpegs above, look at the lower left of the watch face. That's a tiny joystick. We also designed in a way for the player to start a game without any beeps, just in case a surreptitious game was ever desired. 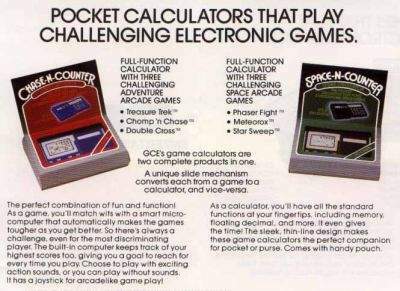 Having done well on Game Time and Arcade Time, I got the next plum assignment: a game calculator. But that story will have to be told in Lesson 19. >Comments = Very interesting lessons! Jay is a brilliant man, and it's always a joy when I run into him at Classic Gaming Expo, when we both go there. As for what I wrote in FAQs 18 and/or 19, I'd be happy to correct the "oversight," um, "halfbrew." Please send me exact wording for the "credit" I ought to give Jay. OR... explain exactly how I shortshrifted him in any way. Some have theorized that "halfbrew" might be the son of Jay Smith. Jay was my boss at Western Technologies in the early 1980s when the events described herein took place. Jay often had his son test the toys and games we created. I have no idea what "LUM" is. LMU, Loyola Marymount University, is near where the events described took place. © 2002 Tom Sloper. All rights reserved. May not be re-published without written permission of the author.